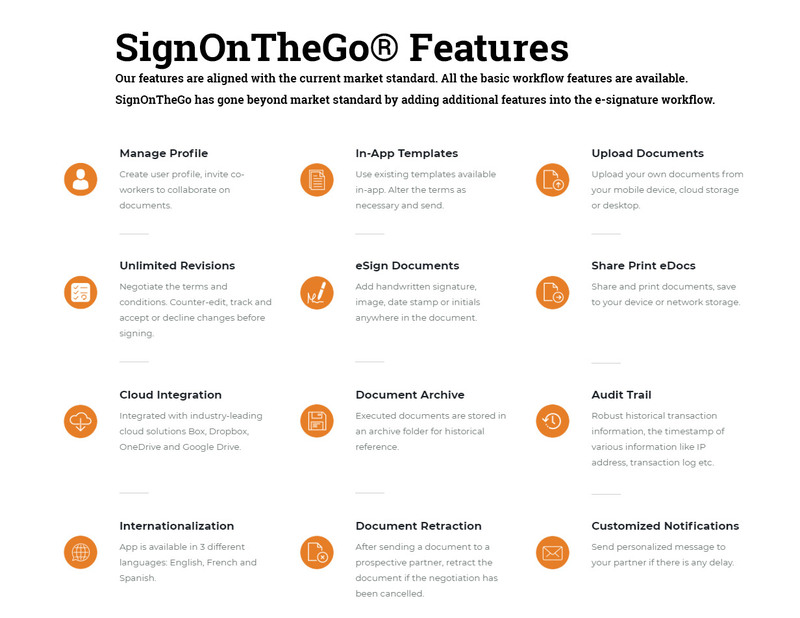 SignOnTheGo, an e-signature platform that allows users to edit, sign digitally, and send official e-documents to all prospective business clients. "This App is Very Easy To Use!" We just got this service a couple of months ago. And what l like about this app is its blockchain feature. I also like the ability to give my clients the opportunity to make edits to a document instead of getting a phone call and redo the work. At this time, I just would like to see some more features added to the editing feature. I don't like the selection process before I start processing a document. That can be polished a bit more. As a user, I would recommend this esigning tool. It looks like one of the best ones that people don't know about. I really like their features. A lot of hidden ways that make my job a lot more efficient. I definitely recommend this tool. We were looking for an affordable e-signature platform that could also handle our requirements. This app beats all the others in terms of bang-for-buck. We have been very busy this winter in implementing a series of new features per the feedback we've received and per direct requests from existing users. Please stay tuned for more improvements!! "Agreed! SignOnTheGo is a True Contender!" I have been doing this for awhile now. This platform has tremendous potential! I like the user interface. I like the entire workflow process, whether you need to edit or not. I love the additional security integration and decentralizing the agreement process. I can see these guys heading towards the smart contract process. I love that! I had the opportunity to speak with the CEO, I was very impressed with the way he is receiving feedback from regular users and how he is trying to implement the changes that we are requesting of his team. We had requested for a better editing feature and I believe we are days from seeing the latest release that will address this request. I encourage new evaluators to try SignOnTheGo. They will not regret this. I am very hard to please. And, this app is far from being perfect, however, this is a well-kept secret in the e-signature pool. We process a lot of documents here. This app makes our daily tasks a lot easier. We also save a lot of money in the implementation and the yearly cost as well. "The Most Effective E-Signature App Today!" We love this app because it will provide us with the ability to: 1) collaborate with our clients 2) securely archive the documents 3) The integration of blockchain technology. At this time, we are very impressed with the platform. From speaking with the founder, we are very excited to hear about the improvements that will be coming. We will wait to see these improvements and come back with another review here. I strongly recommend this app to anyone who has the need for an e-signature platform. It is amazing to me how one could miss-evaluating this app. Pay attention when you are looking for a service like this. We generate a lot of documents that need our clients' signatures. This platform reduces the amount of time it takes to get these documents signed and processed. We could not be happier with the pricing structure as well. Very affordable!! "We Are Convinced - A Great App To Increase Efficiency"
We have decided to bring in more order into our process. SignOnTheGo helps with a workflow that allows for edit if necessary. The app has a great user interface. The workflow allows for full control on who gets to sign first and last. The ability to save all executed documents in archives. Personally, I would love to see the archive restructured, giving the user the ability to create folders or categorized the archive section for ease in finding files in the future. That is nice-to-have for me. It is not a deal breaker. Personally, I strongly recommend SignOnTheGo to anyone company. Especially law firms like ours. I think this app is tailor-made for that type of a business. we do a lot official documents that need our clients' signatures. And the way this app is setup, it is ideal. It looks like the app continues to get better in terms of improvements. We wanted to increase efficiency in the document signing process. Now, we have this efficiency with SignOnTheGo. The process time has been reduced significantly. We we were also looking for an e-signature app that would be cost-effective. We have that with SignOnTheGo. "Simple tool that decreases use of paper majorly and signing process is streamlined and faster." There are so many valuable components to SignOnTheGo, even the most basic (pay-as-you-go) version sends and signs electronic documents to anyone with ease. You have the capability of multiple signers, templates, and saving documents as needed. I've previously used DocuSign and I view SignOnTheGo as a comparable alternative for those of us who need more affordable solutions. This is a great e-signature tool overall! I can honestly say that I have yet to find anything that comes close to a "Cons" to write here.. I could save many years of stress and issues using other digital document services. I’ve used many other platforms when signing documents, but SignOnTheGo is by far the most user-friendly and better product. I have clients on the road that don't always have access to a fax machine so this tool is .... My customers can instantly agree to terms which allows me to meet deadlines quicker. We really appreciate you for taking the time to support us! "The Next e-Signature Market Leader"
I want to take the time to give credit where credit is due. These guys are new on the market. And, one can easily see that they took the time to unveil a quality product! First, the user interface is outstanding! Second, the negotiation workflow was well-designed. Third, The audit trail feature has some unique details that very few will notice. For example, when a document has been executed, if there has been changes along the way, that information stays with the document forever. One can actually drilldown to a particular edit event and see what was actually edited. Lastly, the blockchain technology. I love the way that my documents are now treated as a valuable asset. I can see where these guys are going with that - smart contracts! I have emailed SignOnTheGo team about the editing feature. It is still a little rough. I would like to see a better user experience approach. Eventhough it is a little bit rough, it is one of the very that actually works. I strongly recommend SignOnTheGo to others. This app will be one of the next market leaders! It is a must-have if you are serious about improving the efficiency of your workflow in terms of digitizing the agreement process for your company. This esignature app helps us save time and money. It also helps become a more efficient a closing our agreements and contracts. I have also saved money in the cost of getting the right esignature platform. After comparing prices. The couple of companies that matched these guys in price but couldn't match them technically. Sara, thank you for the kind review. We are humbled!! And, thank you for the email you sent in the past week. We are very happy to let you know that your request for an improved editing feature is on way!!! "VERY USABLE APP WITH GOOD FUNCTIONALITIES"
This app has one thing that I was not able to get from anywhere else: The ability to compare the different versions of an official documents that went through a series of revisions. Now, I can go back in time even after a document was signed to see the trials of changes that happened. Furthermore, I am now able to go directly to the audit trail history and access that information. I can do all that without impacting the final signed version. I would like to have a more polished review/editing feature. What is there at this time is good, but, can be a bit more polished. I look forward to see improvements there. I would like to provide a very strong recommendation to any other e-signature user to get this app! I am recommending this app solely based on my experience and my preference in terms of functionality. Again, no other e-signature company has such a polished audit trail feature like the one of SignOnTheGo. To me, this is one of the most important parts of the e-signature process. Digitizing the contracts/agreements process. Reducing execution time. Increasing efficiency. Reducing errors in submitting an agreement through the email. Reducing costs of mailing through the postal services. Thank you for the review. We are working hard on the next iteration of the editing feature. You will be very pleased for what we have in store. Please stay tuned! We are just about 2 to 3 weeks away! "Best e-signature app for daily use"
Being in HR I use this program every day and I feel like my clients are at ease using the app to sign documents that I send them because of its secure blockchain technology. I like that my clients do not have to create accounts to sign documents but have the option to if they wish. I do not have any complaints or suggestions for improvement for the software. It is easy to use and very intuitive. Simple and easy interface, solid tracking of requests with reminders, flexible form creation and adds a very professional workflow to any signature request. Our business has been using paper documentation for many years and we are trying to both go paperless as well as obtain a more secure and loss-proof system of storing important legal data. I have realized the benefit of cloud storage of signed documents with SignOnTheGo is ideal for both HR Management and Recruiting Personnel or Agencies. Thank you, for supporting SignOnTheGo!! "E-Signature Platform with Bang for the Buck!" Without a doubt, this e-signing tool has some of the best features after 2 days of search. The best things about this app are: 1. Pricing, 2. All Feature Access, 3. Blockchain, 4. Administrator Dashboard functionality, 5. The editing workflow. This feature provides with the flexibility to give your signers with the option to review and make edits when necessary or required. This is a very good feature. SignOnTheGo's API services will not be available until January 2019, according to their team. The Archive feature is very important to me. Currently, it does not have a folder structure where we can save by document types. The editing feature is a little bit cumbersome. Some more work needs to be done to polish it out. This e-signature platform came highly recommended to me. I second the high recommendation for any other users out there. The Pricing structure is very good. And the technology like blockchain separates this app from the competition. The level of security for our transactions have another layer that will be useful to others in the future. We are eliminating the need for files to be printed, we can keep them all secured. We are also having some major savings. We have access to the Economies of Scale Plan that provides with over 5 users. With that, we are able to save upwards of $1,200/year. With this budget reduction in money spent for CRM, we are able to shift some of this to other weeded tools. "Our E-Signature Tool of Choice"
We are a Polish-Based company and we like these things about SignOnTheGo: 1. They are innovative with the blockchain technology - 2. They give pay-as-you-go options - 3. Features accessibility for all plans - 4. The flexibility of the workflows. The User Experience is very advanced. We would like to have the ability to do mass signing or signatures in bulk. Currently, this tool doesn't have this feature. We request for this feature to be added. We are now doing multiple documents. The team is medium size, we would like to have some categorization in the Archive space. That will be very good to have this improvement as soon as possible. We recommend this application to other users. It does a good job in saving small business money for this type of service. We also recommend this application to other users that need flexible workflow. The technology that this company used like blockchain is different in this market. We like that very much and, we have belief that other companies will find good use for this as well. We are making good advancements in e-commerce transactions. This a new thing in my country. E-Signature is becoming more mainstream. We are now ahead of the curve in terms of getting contracts and official documents signed in a very quick time. We are saving my money in postage as well. We are reducing the need to maintain additional filing cabinets after printing the official documents. We can now print on demand. Thanks to our polish partners at Systemy! We are hard at work on improving the changes the changes requested by our current users. "Strong E-Signature App for Small Teams"
Surprisingly, I didn't have a high expectation about this app. But. I was wrong. These guys took the time to: 1. Provide an exceptional design; 2. The workflows provided are robust. Their workflow are very unassuming with multiple capabilities; 3. The security approach is better than most. The other pleasant surprise was the innovative approach in implementing blockchain. It is refreshing to see small companies leading the way in forcing a market shift. I didn't see anyone else doing this. It looks like they are a bit behind on their APIs. We are looking for Salesforce integration. Something they do not have currently. We are planning on utilizing this as part of our Salesforce infrastructure. I would definitely recommend this e-signature app; even though they do not have their APIs fully functioning. This is tailor-made for small businesses like ours. Their price point is one of the reasons why we gave these guys a tryout. Take a few minutes to navigate and fill your way around. I sent a couple of documents out as tests within my team members and I was off... That was my experience. Pretty easy and straight forward. We are relying more and more on these types e-signing platforms to conduct business. It is a reliable process where we can have all of our files in one area. We are also seeing a major saving when comparing SignOnTheGo with the competition. We are at the early stage of setting up for API services. We decided to first focus on improving the app itself. We are going to make our clients very happy with the upcoming of our API services. Stay tuned! "Technically Advanced & Affordable E-Signature Platform"
I like the way they used the blockchain technology that will help improve this market space. As a buyer, I enjoy the affordability of their services as well. Their pricing model works for my budget. I like the way this app was designed. I helps keep all of my contracts together. I do a lot of contracts for a small business. This is the only app that had most of everything that I was looking for. Their editing feature is good, but, I would like to see an improved user experience. It needs to allow me to see my entire document while I am editing. I want for my collaborating partners to go through the documents as quickly as possible and not trying to figure the feature out. Once they make improvements in this area, I think this will be awesome for both me and my partners that I will be sending documents to. I will strongly recommend this app to other users. The user interface and user experience is very good (overall). Their pricing model is better structured. Most of all, I like their all access of all features offering. You will not have to pay for additional features, you pay for their services. This was a financial decision. I did not want to have to pay more than necessary. This tool saves us some money with their pricing model. This will benefit my company a great deal. A saving of over $1900 in comparing SignOnTheGo to the market leaders. Thank you for the candid feedback. We are working towards improving the user experience for our editing feature. We have something special at work based on your feedback. It will be released soon. "The Best Money-Saving E-Signature App"
This App provides the ultimate flexibility while giving small businesses like mine access to the latest technological advancements. I really love the fact that all the features are made available to me. This is a big plus for me. And, they are using blockchain as an additional security approach to ensure my documents are authentic. The Archive Feature needs to be improved. The files are not categorized. I recommend that they provide the ability to create folders so a user can archive his files the way he wants. From my experience for the past 3 months, I strongly recommend this platform to any small business that is looking for saving money and still have a top-notch tool to conduct business. I am very happy with switching to SignOnTheGo and others will too. Spending too much on e-signature platforms. Provide additional security for my executed documents. I am able to save more than 50% versus my previous e-signature platform spending. I will be able to save over $1200 for my small team. We are working hard on the Archive Feature. Improvements coming soon. "SignOnTheGo makes my business easier"
This program has seriously made it easier for my business. Instead of having a client sign a physical document and mail it back and forth, which can take days, now I can just send it to them via SignOnTheGo and it's official. It's very easy to use and all my clients find it easy, and self-explanatory. No one has had any issues signing a document. All of my documents are FINALLY stored in one place, and it works on any device, computer or mobile. Additionally, Customer Service is great and they get back to you quickly. I really like their platform and have recommended it to other colleagues. SignOnTheGo has really helped my business move in the right direction with its easy platform! I have nothing bad to say about them, I've had nothing but good experiences with them and their software. Look no further, this is the product you want. After reaching out to them for additional information I found that the team was very professional and helpful. I've never encountered any issues, but I can tell from the experience that I had that the team is armed with knowledge & cares about their customer's experiences, regardless of how large or small the client is. The old cliché of “time is money” plays a role in every business and mine is no exception. I save tremendous time in sending out contracts, waiting for customers to sign; I've eliminated the need to print, sign scan, convert to PDF and then email; the ease of use is awesome and my new customers love it. Thank you for the review, Magdalena! "Made my electronic document signatures a much simpler process." 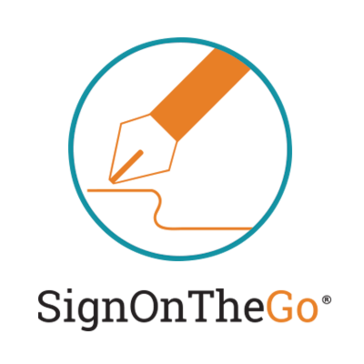 I liked the fact that SignOnTheGo was a fast way to get signatures from my professors for my future recommendation letters that I will need for jobs I am currently applying for. They had several templates already set up for me making it easier by allowing me to edit, instead of writing everything from scratch and not being aware of the proper format. At first it was a bit difficult understanding the roles of the signers, but I was able to understand it after a few trials. Definitely give them a shot! They made my life so much easier as a student and taught me a lot about the format of these important templates. You won't be disappointed. Thanks to SignOnTheGo I am now able to easily edit any academic and professional recommendation letter to help me apply specifically to certain schools or jobs. I realized that SignOnTheGo is also the cheapest option for me compared to other platforms. Also, they have resources for me and other people to help them understand what formats they need to use if they want to have a professional feel to your documents before sending them to the proper signer or recipient. I am also very pleased with the mobility, security and simplicity of this application. They have many Video tutorials speaking about how to use their app, as well as, pricing and other.. SignOnTheGo saved me a lot of time and money and I will recommend it to my friends and family. Thank you for the review, Shay! "Easy to use solution for getting your documents signed." SignOnTheGo is very easy to execute and implement. But the main thing that attracts everyone towards utilizing this platform is the customer support which is exceptionally best. In my industry we have to process a great deal of documents. I can use one of their templates, or upload my own from OneDrive with ease to my SignOnTheGo profile and I can reuse any template at any time. There are some features that are missing and when I spoke with customer service they informed me that those features will be rolling out in the next few phases. I look forward to seeing these improvements because this tool is the best I’ve seen out there. Using SignOnTheGo is effortless and is extremely affordable for any size company no matter how many documents you send out. Time is money and reducing turnaround time from sending to receiving signed documents is key. Faxing is an ancient technology and some people don’t have access to one. Scanning documents can be just as cumbersome, time-consuming and expensive as well and snail mail is simply a last resort option. SignOnTheGo allows for real-time interaction without the hassle and expense of other traditional methods while providing a paperless environment..
"Most advanced and cost-effective E-signature platform on the market!! Highly recommend!" SignOnTheGo is very easy to use and it has so many features, like being able to see all the changes and revisions that you and your partner have made. I can use one of their many templates that they have, or I can upload my own and I can reuse any template at any time. SignOnTheGo also keeps my files neatly organized and makes it very easy for me to track down a document at any time I may need it. It's also very inexpensive and there's no contract tying you down. I can honestly say I don't have any dislikes, I've had nothing but good experiences with using this software! If you want to save costs on paper and are able to have your document signed in seconds, then this is the right software for you! Super easy to use and it is very secure. I couldn't be any happier with this application. Cutting down on all the paper trail. Also, it's better for the environment! I'm saving time too, I have been able to cut down on signing time. SignOnTheGo also, send me a notification when the document has been signed so I'm able to retrieve them faster. Some of my documents that I send have very sensitive information, It puts me at ease knowing my documents are kept secure. "Best New E-Signature Platform "
Signonthego has saved me from the hassle of scanning documents or delaying meetings until I have reached a specific place to make the final call by signing the document. It has brought me the comfort of exchanging important contracts with my business partners even when I am away. My only (minor) gripe relates to unstructured category of templates library. Need folders. I was spending more than necessary to execute my agreements. Now, I pay for what I need. These guys are correct. They are charging me less because I am not going for unlimited usage. I don't need that. I process 50 to 60 documents a year. I also like the blockchain technology they implemented. I don’t know a lot about how it works, but, I understand the concept. Now, any document that I process will have a way for me to verify it. That is a pretty cool security feature at a very affordable price too. The overall productivity of my business has increased because of its mind-blowing blockchain technology. All proposals, contracts, and clauses are properly verified now, all thanks to it. Exchanging documents was never this safe before. Thank you for your candid review of SignOnTheGo. We are currently working on restructuring the category of our templates library. We are working hard in improving this aspect of the app's feature. Again, thank you for taking the time to review our app. This is very important to us! We will be improving every day! SignOnTheGo is a game changer for our business. It decreases the paper needed on both sides. , and takes the ability to send, track and document a sound process for business to move forward. The application is as easy as A, B, C.
Nothing, everything works good. If you need help you can call the customer service and you will get help right away. Every chance I get, I’m praising SignOnTheGo to my clients and friends. It’s truly a great product and the staff is amazing. Anytime I had a question our lead account rep Gabriel was always there to help and followed up right away. Thank you folks for validating the SignOnTheGo Team's hard work!!! "User with with over 6 months experience with SignOnTheGo"
I like the templates that SignOnTheGo has in stock, they are clear and profesdional looking. I was also able to upload multiple templates of my own. When the templates are created, my team can create specific documents for review and signatures. Also, the fact that they use blockchain is very important to ensure the executed documents are secure. There are some formatting challenges when importing word docs as templates and some editing challenges where fonts wouldn’t seem to format correctly. But their customer service is beyond exceptional and they were very accommodating to my needs. I can send contracts and proposals to prospective clients, to renew agreements to current customers and partnership contracts for business development companies. SignOnTheGo helps to provide professional looking contracts without much effort. Furthermore, thanks to its tracking features I am able to know when I need to follow up. "This App reduces cost and provides great features"
I like to carry my ipad with me and have my clients sign my contracts on the go. It takes little time to set things up for me. I have my favorite contracts in order and pre-staged. I would like to see some refinement with the app. I want to see less steps. There some things that I don't really need. I think they simplify things a bit more. I personally like this platform. I rank it higher than most of the other platforms out there. I will not be surprised if this app become an everyday brand. I recommend it. We have reduced the amount of paper we print weekly to bring to clients. Save money and paper. It is also very good on our budget. "The Best New E-Signature App On The Market!" 1. The app has better features than most of the older e-signature apps. 2. The user interface is fresh and very user-friendly. 3. The app allows for recalling/retracting documents. 4. The blockchain feature is amazing!! What I want to see is improvements in the editing feature and I would like to see these guys stay ahead of the market. I would recommend SignOnTheGo to companies that are processing a lot of contracts. This app will make life easier and will be a big time saver. We do a lot of contracts work and we also have a lot partnership agreements on a monthly basis. The time to getting these documents signed have been reduced drastically. "New Team and Very Happy So Far!" This eSignature app has been a tremendous added tool for us. Very competitive pricing. Very strong and advanced features. At this point in time, my entire team will be giving their own dislikes about this app. In my prospective, I would say that there need to be a better way to compartmentalize the archive folder. It is good to be able to create different folders for the list of clients. Strongly recommend for a small team of 5... I like this company and team. Major improvements have been made since we joined. SignOnTheGo provides my team with a flexible plan. The benefits are: a tremendous amount of savings and a competitive tool. "A Diamond in the Making"
This app is fairly new (8 months, I believe). It has great potential. I like the editing feature that my clients can use for when I send documents to them. I would like to see some more improvements in the user experience. A lot of capabilities or features are hidden. I hope they clean it up. I recommend this app to other businesses like ours. They save us time and money. They are not expensive, yet, the provide a good product. I know it will get better. We have access to all things we need to process agreements electronically, at a much more affordable cost. SignOnTheGo is clean and easy to navigate. It is very clear on how to assign the signing tasks to singer or signee. I love that all the features are available to everyone. I don’t send a lot of documents but I can still use it the same way as an enterprise user. There are a few bugs but they are aware of them and have assured me that they will be fixed in the next few versions. I use a NDA with contractors, interns, and staff. Before my interview is over, I can have a tailored NDA in their email inbox ready to sign within minutes. That is a huge benefit for me to keep up with my fast-paced business. Plus, all of my signed documents are organized and archived in one place. We will continue to improve! There is a lot more to come! "Very good e-signature app for my small business!" SignOnTheGo is very easy to execute and implement. But the main thing that attracted me was the affordability of this tool.The customer support is exceptional. I was able to speak to SignOnTheGo Representative to get me setup. This is the best and more convenient way to store my templates and fully executed documents in the same app. No more paper storage. Because I am a small business. I need to save space. No more useless file cabinets. I don’t have any problem with the app at all. My use is very straight forward. However, I would like to have different folders in the archive section. I want to categorize my executed files. time-consuming process and very expensive e-signature applications. And I don't need to rely on my emails to get my contracts done. I have a tendency to delete my emails with executed documents by mistake. For a small business, I would recommend SignOnTheGo to other companies like mine. I strongly recommend SignOnTheGo to anyone who is looking at saving money with a very e-signature application. I am a very small company and I like the fact that I can fit a tool like this into my budget. I also like to promote small company as well. "Perfect for my on the go business!" First of all: it's by far more economical than what I was previously using (not sure if I'm allowed to say who here.) I like that I don't have to be tethered to a desk or laptop to get my contracts signed and my customers love that we don't have to play phone tag or re-work schedules to get their contract approved and home remodeling started. I love that if my clients want to change something within the contract I can easily see what the changes were without having to hunt for them. I also like that I can assign specific fields to my customer's, which helps tremendously when you have the ones that get easily confused on what they need to sign, initial or pay close attention to so that they understand everything completely. I spend less time saying "This doesn't apply to you, but that does," and they spend less time guessing what needs to be completed for the job to stay on schedule. The last service I used I was able to complete my contracts completely on the document itself within the specific fields, which was nice. I am still able to complete the document and easily understand what fields I am filling out with SignOnTheGo, it just took a little bit to get used to that format. To be honest, the tradeoff is I can easily change any verbiage within the contract on the spot. I couldn't do that with my last service because I was only limited to editing whatever was in the fields. The folks at SignOnTheGo said they are developing a feature that will allow me to make the same changes on my actual document soon, so this "dislike" is temporary. Other than that-these guys are a game changer. DO IT! You wont' be sorry! This system is so easy to use, so flexible and absolutely the best people to work with! As a small business in a highly competitive residential contracting industry, it can be difficult to keep up with contracts, change orders, subcontractor agreements and all of the little day to day purchase orders that go along with my jobs. SignOnTheGo has helped me reduce the amount of time I spend getting documents signed and increased my productivity in keeping my jobs on schedule. I don't even have to leave a job to sign off on purchases: I literally upload the file, sign it and send it back. I can negotiate terms with my subcontractors and have all of their paperwork in order in a matter of hours, which really helps limit my liability and keeps me in compliance. I have one client that I work Bank Owned properties for and I have spent hundreds of dollars with Fedex exchanging contracts because they are out of State and need originals or I've had to leave a job to find a place to print, sign and scan documents back while I'm on the road. The savings in time and money I have had in the the few weeks of using SignOnTheGo ALONE has already paid for my subscription! Much gratitude to you as a new user! Also, we are working hard on improving our editing feature. You will love what we have in store. It will be unique to SignOnTheGo! Thanks again from the entire SignOnTheGo Team! "Absolutely The Best Investment I Ever Made For My Business!" First the price is unbeatable! I was looking at other programs and there was no way I could spend that on my little operation. The representative I worked with helped me every step of the way in setting up my documents and templates and I like that even though I’m on a small plan I have every feature I could possibly need to get my agreements signed by my clients. I am pretty savvy with technology but SignOnTheGo was really easy to figure out without much assistance, which is good for my clients who are not necessarily as skilled. I don’t really have a ton of dislikes so far. Initially and in conversation I mentioned that I’d like to be able to organize my files when they are archived. This wasn’t a deal breaker for me but literally a few days later I received a message stating that they were going to add that feature soon. I think it’s nice that even a small timer like me gets that sort of response. I would highly recommend SignOnTheGo to anyone, especially if you are like me with a small operation. It’s so affordable and the customer service has been absolutely amazing. Everything is so straightforward and what’s great is there are no surprises or fine print. They truly converted this skeptic into a believer. Before, I was chasing down people (or vice verse) trying to get agreements signed or emailing them and receiving copies I could bare read. I have a home office and it’s very difficult to get things accomplished if I’m spending more time on the road trying to meet clients for signatures. SignOnTheGo really helps me have a faster turn around time and a more productive day. Thank you for using SignOnTheGo!! The ultimate goal is Customer Satisfaction! Please feel free to email us if ANYTHING we do is below your expectation. Thank you so much for your time to review our e-signature platform. "Very Good E-Signature App For The Team!" We have a strong workflow with this app. We have the ability to become a lot faster with the execution of our documents with our clients. I don't have any thing negative to say at this moment. The only critic I have is for more improvements to the editing feature. It is a little clunky. I will recommend this app to other users. I am confident they will like it. We looked around at other e-signature apps. These guys have a lot more to offer to the users. We now have a quick turnaround with the execution of our documents. From more than 2 days to hours or less. Thank you for taking the time to review our App! "Great time saver and easy to use on any device"
SignOnTheGo allows me to conduct business whether in the office or on the road. Its effortless to upload documents from my desktop or mobile cloud. From there, to edit and assign multiple signers, track the progress and store and archive for later use and review are all added benefits that save me time. As with any software there are a few bugs but I'm told by Customer Support they will be fixed in the next version. Aside from that, this product is really great. Its cost effective and easy to use. Our documents are being digitally signed with complete convenience and confidence. As signatures get completed faster than the old process of printing, signing, scanning or faxing, there is significantly less room for errors. With SignOnThGo, we have improved our business day to day activities and have seen an increase in productivity. "User friendly, inexpensive and great tool to manage documents." SignOnTheGo is very easy to execute and implement. The mobile app is awesome! The efficiency this tool brings to our company saves us time and money. Great customer service. No negative feedback to provide at this time. 100% recommended...A great resource for any business!!! Eliminates paper trail which is a huge benefit to our environment as well as saving space and money in our offices. Efficiency and organization has escalated. Transferring secure documents couldn't be easier. Thank you for the review. We appreciate the support! I liked best about this company is that the product completes the main objective of what the product was meant for. The product works, but like any and all companies at this stage in the companies life cycle, I hope to see it evolve and grow. I would use the product if I needed to do what it was meant for, while I was on a full network because I know that everything will go the way it should. Like any and all companies at this stage in the companies life cycle, they have room to grow and evolve. This company is no different and will make the changes that need to happen in this stage. The C.E.O. even has made it clear on the state of the company. I hope that this company does not stay a "start-up" much longer. It would be nice to see the company focus on what is important and believe that it is already where it wants to be in order to be able to produce the product that is worth what you pay for. The product needs to be user friendly from start to finish on the bright side signing up was very easy. I was told by the Owner and C.E.O. that "this product is at the start-up stage of the products life cycle!" My recommendation is to use the owners advice. I focused on testing the product pre-launch and directly after launch, as well as testing the mobile capabilities of the product. I realized that the product's core function works. I would feel safe using this with a secure, high speed network in order to complete the task that I need to finish. I pushed for educational "how to" videos in order to make sure that the customer knows how to use all aspects of the product after the sign up process. Thank you for the candid review! We certainly appreciate that, especially from someone of your knowledge of SignOnTheGo! "SignOnTheGo the Next Hit of e-Signature Product"
Low cost is the number one reason but most importantly the quality of product which does not get compromised by the reasonable pricing. The convenience of non-contract fits the name "sign-on-the-go." But it's also scale-able with different tiers of services that you subscribed. Availability of customer support is better than DocuSign. Low cost and ease of use. Non-contract-binding is a great convenience for small business and personal use. Also the quick response from customer support. Thank you for the candid review. We will look into the Language Selection feature and make some improvement. "Small Business Needs - Works great"
very quick and easy to use. I appreciate that I can see my document in full while I am adding/editing the fields for my customers to sign. Also, there are no hidden cost. "Excellent App that saves time!" Great app! Allows you to automate forms so that you can send them out for completion and signature easily! None - Excellent App - They streamlined administration of documents upon my feedback. Helps to stream-line information collection - making it easy and convenient for the client. We will take a look at the tool box. We will have our designers play with it and see how we can provide a better experience. * We monitor all SignOnTheGo reviews to prevent fraudulent reviews and keep review quality high. We do not post reviews by company employees or direct competitors. Validated reviews require the user to submit a screenshot of the product containing their user ID, in order to verify a user is an actual user of the product. Hi there! Are you looking to implement a solution like SignOnTheGo?